On Saturday 12th November, we teamed up with our friends at A Rule of Tum and Method Coffee to serve up an exclusive winter brunch. The Bookshop was the setting for a cosy and delicious meal, made using seasonal produce from many local, loved suppliers. Served in a feasting style, the tables were filled with an abundance of the county's offerings; from homemade jams to rare breed sausages from Farmer Tom, everyone left with full tummies and happy faces. (See below for the full list of suppliers). We were lucky enough to have the lovely Mark from Method Coffee on hand to serve up the most amazing 'little lattes' and French Press coffees. For the non coffee drinkers, we sipped on Trumper's Tea + Organic Apple Juice from Hermitage Farm; all of whom attended the Festival. It was a great opportunity to bring together all of our favourite suppliers and create a meal of celebration with a great sense of community. Big thanks to all who attended, as well as Chef Nicole and her team for doing such a fabulous job. Alex Gooch (Rye, Sourdough + Chelsea Buns), Seb's Organics (Chard, Spinach, Celariac, Pear + Quince), Tudge's (Bacon + Black Pudding), Netherend Farm (Organic Butter), Farmer Tom Jones (Rare Breed Sausages), Neal's Yard Creamery (Greek Yoghurt). It’s always interesting how cooking with a particular ingredient or flavour can take you to a certain time or place - how food can evoke a certain feeling of emotion or nostalgia. 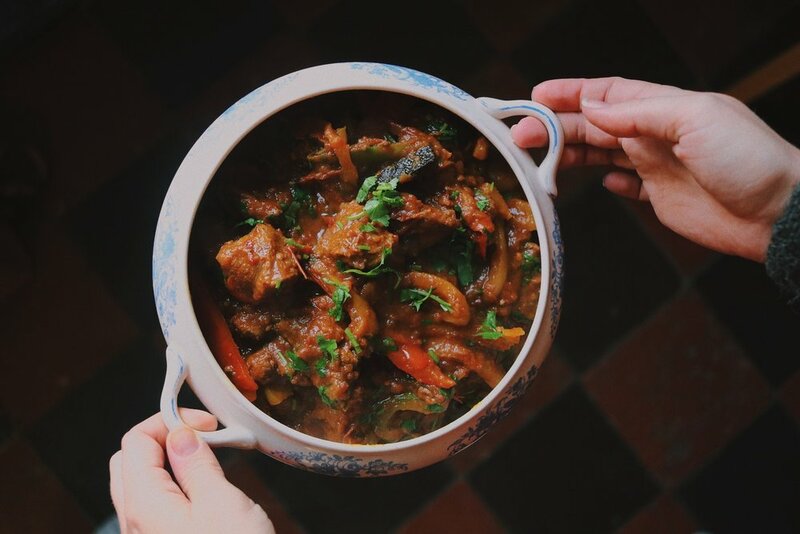 As we sat in Rayeesa's farmhouse kitchen in Mordiford, she tells us of her own experiences and growing up in Hyderabad, Southern India, and how her connection with food, from that region in particular, brought her to where she is now. Rayeesa makes traditional Indian cooking sauces and hosts cooking classes from her home. After moving to Herefordshire she realised that the British opinion of Indian Cuisine, buoyed by dodgy take-away food and ready meals, was something that she wanted to change. Rayeesa’s meticulous attention to detail; from selecting and balancing spice, to the technique for cooking perfect fluffy rice, is a great insight into real Indian cooking. Through the duration of our day in Rayeesa’s home, we prepared and cooked four dishes from different regions; Lamb Rogan Josh, Lentil Dahl, Parathas and beautiful Steamed Rice. When the oil starts to separate add the meat and seal with the spice mixture. Add the tomatoes and a little water, let the lamb cook on a low heat. When the lamb is almost tender add the peppers and stir together, let it all cook for a further 5-10 mins. Taste + season if needed. Garnish with fresh coriander + serve with basmati rice or chapatti. The juxtaposition of having an Indian cookery school in an English farmhouse worked perfectly; using top quality + fresh local produce to create something inspired from four thousand miles. If you would like to expand your knowledge of Indian cookery at one of Rayeesa's classes, or to find out more about what she gets up to, click here (Vouchers are currently 20% off if purchased before end of Dec 2016). We cannot WAIT to work with Rayeesa + her spiced girls in the future - see you at the festival!